You don’t have to be 6 ft tall to throw the ball in the upper 60’s. I know for a fact that this is not true. How am I so certain? Because I did it. It didn’t come easy and it didn’t come on my own. With a strong work ethic and amazing pitching coaches growing up, especially one who taught me some of the BEST fast pitch mechanics from age 9-13, it can most definitely happen. For someone under 6 ft tall or 5’10 or even 5’8, to throw in the upper 60’s, you’re going to have to have solid mechanics, especially with the lower half of your body. Gaining MPH in your pitch comes from a great delivery, a solid foundation of base mechanics and using your lower half the correct way. I want to tell you about my mechanics as I take you through a slow motion video and explain through each frame exactly what I am doing. I also draw lines, circles and arrows for a complete video analysis. Enjoy! Let me know what you think and if you have questions! Have seen you on Youtube and like the simplicity on how you explain pitches…Googled you to learn more about you and found your website today. I want to show my 12 year old daughter in hopes she will like you and inspire to be like you 🙂 Jenny Finch is a favorite of hers, but she needs another role model. I found this “Fastpitch Pitching Mechanics Analysis” on your Blog, but couldn’t find a link to click on to watch. Can you please help? I really enjoyed your analysis video. I am a male high school coach interested in learning how to throw with correct mechanics so I can pitch to my players, instead of just throwing front toss. What advice do you have, or resources would you recommend to help me learn to throw correctly myself? Also, do you do analysis/coaching via email? I would search on youtube. THere is a lot of free information there. I have some instructional videos as well. 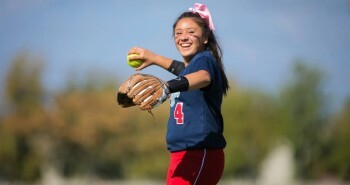 Here is an example: http://amanda-scarborough.com/softball-pitching-tips-101/ And others comes up when you search for my name on youtube. As far as analysis/coaching via email, I do not offer that at this time, but possibly in the future! Great idea! My daughter is 10 and has made the transition from baseball to softball starting with this fall 2014 season. She has great coordination and my concern is getting her started with the basics of pitching underhand. She was a pitcher in baseball (and I have to boast a little here), was quite good at it. I believe that she would be a good pitcher for softball as well, but having never coached it, I have no idea how to get her started. Any guidance from you would be great. She, like you, will also top out at around 5’4″ based on family history and her current stature. I hope that she can be just like you! She’s young! She will be fine! Get her with a good pitching coach in your area! I would suggest getting her with someone who has played in college and is female! A lot of people tell me that my youtube videos are helpful….so you can always start with those. Type in Amanda Scarborough Fastball. And Amanda Scarborough 3/4 drill! I’m the daddy of a 14 year old pitcher. I use your videos often to help my daughter in mechanics. I’m desperate to get her more push! She throws hard, hitting 60 somewhat consistently, but pitches mostly upper body. This video helps! My question is your glove arm. 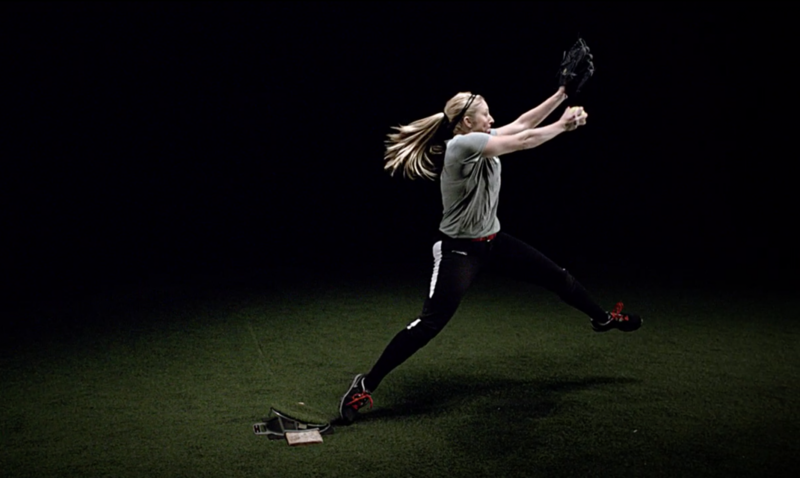 She throws her glove arm out away from her body identical to the way you do. So called experts are telling her that is a no no, but when I see a very successful pitcher doing the same thing……I have a hard time dwelling on it! What do you think? Also, like I said, she throws the ball hard and hits her spots very well, but we struggle with push off and the change-up…..any advice is very welcomed!!!!! Thank you! The way my glove goes is not HORRBIBLE. It goes out a little, but the reality of the way the body moves is that your glove hand will NOT just go up and down. It does need to be stay somewhat around a solid position, but the way I describe it is that your glove hand will move a little like the letter C when it pulls down. It’s impossible for it to pull down like the letter I and still be able to get good hip rotation when you land. If you were looking at me from the catcher’s perspective, my glove hand really does not go out THAT much, it’s definitely not majorly “swimming” as some might call it. The best thing you can do is monitor it and make sure it is not going out TOO far because the further it goes out, the less you can get open. As for gaining MPH, it’s going to come with her leg drive. Do long toss and measure the distance, try to do long toss for distance and see how far you can actually throw the ball in the air. Try to push to throw the ball further and further. There are tons of leg drills I have on youtube and on our Packaged Deal Facebook page. http://www.facebook.com/thepackageddeal. There are not just pitching drills, so you might have to search on that page some to scroll down! I am going to be a sophomore in high school this coming August. Our summer softball team just ended, but we hope to start again at the end of July. My coach would like to get me to start pitching, even though my primary position is 1st base. I’m trying to pitch the way you do, the same mechanics and all. I’m having trouble with the push off, I feel like I just don’t get as much power as I should, I’m new at this, but could you give me a tip for how to hit certain parts of the plate with a fastball. I’ve watched a lot of your videos, they are really helpful. You are such an inspiration and a role model, so any suggestions or tips you have would be greatly appreciated. Thank You ! Step towards your target, and always keep your eyes on the target the ENTIRE pitch!! Also, think about throwing your fingertips toward the target you are trying to hit! So if i’m trying to hit the outside corner of the plate, I need to stare at the outside corner the whole time and step towards the outside corner? My daughter is 12 and has been pitching for 2 years. Her biggest problem is that she doesn’t use her legs enough. We’ve been working on this for 2 years now and she still struggles. Is this common? What can we do to help her? Maybe she is not using them enough because they aren’t strong enough to support her. Try enrolling her in a strength and conditioning program for explosiveness and/or do explosive movements at hoe on your own. I have an 8 yr old daughter that I have been teaching how to pitch. I have always told her to pitch how she is comfortable. Recently have had a highschool pitcher helping her. My daughter brought her arm back like yours but was told her arm shouldn’t be straight because that could injure her shoulder. When she brings her arm back straight she does great but with it being bent it is all over the place. What is your opinion? I think it could injure SOME people if you fling it back or don’t stretch those muscles. Those muscles need to be loose. But I have never heard of anyone injuring themselves from that wind up! My daughter is 9 and is getting ready to start her first year in player pitch. Fundamentally she does okay but there is a few things she needs to improve on (which I tell her to never stop learning). She hits her spots fairly well and throws fairly hard for a 9 year old but I have tried teach her that throwing hard is not always the answer. Hitting your spots consistently is also important. Her issue is that she does not use her legs enough (5’2″ at 9) and once she gets into her load position she does not go out toward her catcher. It’s like she wants to come up to soon. She watches your videos on a regular basis and we try to use them as learning tools, but I was curious to see if there are any drills to help her stay lower longer into her pitch and not come up to soon. Thanks for all you do to teach and inspire these young ladies. It’s really a strength thing. Once she starts to move forward into her from leg, that is a lot of weight that goes into her front leg. You lose the load if you are not strong enough to support the load! Awesome video it really has motivated my daughter who is also 5’5′. Hi, Amanda am a 27 year old gentleman living in Uganda played baseball and now volunteers to train young people to play baseball and softball. Uganda is a country found in East Africa and its a big baseball and softball playing country in Africa. Am happy to have come across this and wish to up my knowledge about softball so that I can instruct the young girls to do better. So I wish to be helped to understand better the mechanics of pitching in softball, please could you send me some of those videos? I don’t have enough to use but the videos could help me a great deal to improve the performance of these young talented and energetic African girls. Hello! Thanks for watching! Do you have Facebook? Follow me on Facebook http://www.facebook.com/amanda9scarborough. If you go to my Facebook page there you can click on “videos” and video library will come up! I would also encourage you to follow me and my friends The Packaged Deal here: thepackageddeal.edufii.com – try going there and you can learn more from our all access community! Amanda, my daughter is 13 years old and has started pitching in her second season of ball. She is throwing approx 55 consistantly but using only her arms. She is 5’8 approx 200lbs. She has goals set to play college ball, which is great, but, living in middle of nowhere in Ontario Canada, it is hard to find a good pitching coach for her. She has taught herself her fastball and change up. When talking with coaches in Michigan, she needs that leg strength and could be throwing in 60’s !!! How can I get her to that point? She has so much potential and has teams wanting her …. I really want to be able to get her to her next level. Thanks so much!